To avoid overheating and prolonging its service life, it is recommended that you take a break after 3 to 4 hours of use. 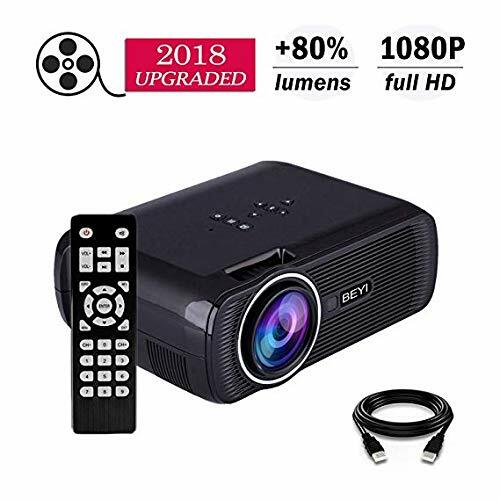 We recommend using this projector in a dark environment for better performance. 【POWERFUL & PORTABLE HOME THEATER】 Full 1080P / 3000 lumen / 1000:1 Contrast all combine to bring clear, bright images anywhere in your life. Lightweight and easy to use. Ideal for family entertainment, such as movie times, parties, sports events, TV series and video games, will turn your life into a minimalist style. Allowing you to take it anywhere you want is a great tool for family time. 【MULTIMEDIA INTERFACE】 Video Projector provides AV / VGA / USB / HDMI interface. With the HDMI cable, you can connect to your laptop PC/PS4/PS3/X-box/DVD or connect it to your computer via VGA port and enjoy videos, movies, TV shows or football matches. AV and HDMI cables are included in the package. 【LOW ENERGY CONSERVATION】Upgraded LED lighting provide high luminous efficiency. Low Power Consumption and Durable, latest smart ECO lamp care technology ensure the energy saving up to 70% and long lasting lamp life for more than 50000 hrs. The new noise suppression cooling system reduces noise by 50%. Keep your attention when watching movies or playing games. 【BEST GUARANTEED】3 Year Warranty. If you have any problems using this product, please do not hesitate to contact us by email. We are always ready to provide you with a satisfactory solution. If you have any questions about this product by BEYI, contact us by completing and submitting the form below. If you are looking for a specif part number, please include it with your message.